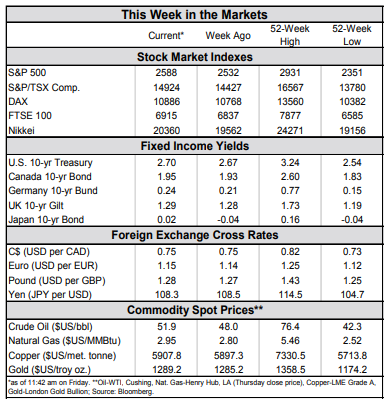 U.S. equity markets built on last Friday’s gains, firming up for the second consecutive week. Seemingly-fruitful trade negotiations between the U.S. and China offered notable support. With respect to data, both the ISM non-manufacturing index and small business confidence have eased from recent highs, but remain in healthy territory. 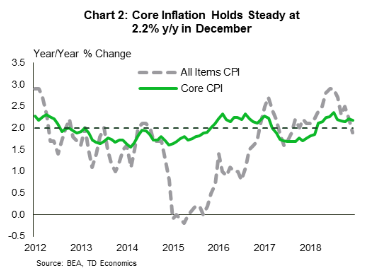 Inflation data came in as expected, with core CPI holding steady at 2.2% y/y. The government shutdown, which is on track to become the longest in U.S. history, may test the Fed’s wait and see approach to monetary policy, given data distortions and delays. If it ends soon, we expect its impact to be quite modest. But each passing week has the potential to amplify the impact. U.S. equity markets built on last Friday’s gains, firming up their comeback in the second week of 2019. The strong December jobs report continued to buoy market sentiment, while seemingly-fruitful trade negotiations between the U.S. and China offered additional support. Discussions in Beijing lasted an extra day, with indications that progress was made on a few items of interest, such as the further solidification of Chinese commitments to purchase U.S. goods. China’s Commerce Ministry suggested that progress was made on more contentious issues as well, such as forced technology transfers and the protection of IP rights. The finding of common ground is a very encouraging development. But, with plenty of work still to be done and details to be hashed out, we’re not out of the woods yet. On the domestic data front, the numbers this week did little to rock the boat. After a hot three-month streak, the ISM non-manufacturing index descended below the 60-point threshold in December. But, at a reading of nearly 58, the index still points to a healthy pace of expansion for the lion’s share of the economy. 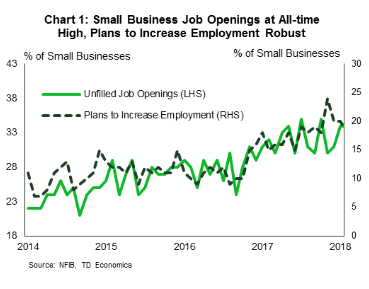 Similarly, small business confidence eased off at the end of 2018, but remained quite upbeat relative to history. Employment indicators from the small business survey also reaffirmed the strength the U.S. labor market (Chart 1). What truly dominated headlines this week were negotiations related to border security that hold the key to ending the partial government shutdown. Talks this week have so far failed to yield positive results. The current shutdown has already matched the longest 21-day closure of 1995-96 and appears likely to extend further. The shutdown only adds to the cloud of uncertainty facing the Fed. 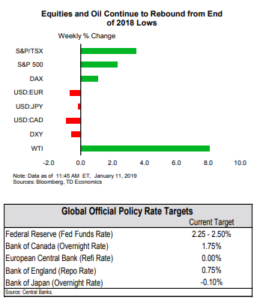 Indeed, the FOMC minutes confirmed that after hiking in December, there was less certainty going forward given recent volatility in financial markets and concerns about global growth. With price pressures easing off in recent months, the Fed is in no rush to hike rates. This narrative is corroborated by today’s CPI data where core inflation held steady at 2.2% y/y (Chart 2). But, this wait and see approach will be challenged by the government shutdown, which will distort the data and delay its release. Ultimately, the length of the shutdown will determine the overall impact. If it ends over the weekend, we expect the impact to be fairly modest, with the closure shaving off about 0.1 p.p. from first quarter economic growth. But the impact could prove to be non-linear, meaning that the economic costs rise with time. With respect to data, if the shutdown extends to next week the jobless rate could tick up by 0.2 p.p. as some 380k furloughed workers are counted as unemployed, though January payrolls should be spared the distortion. Delays will add to the fog. So far, only second tier indicators such as factory orders and new home sales have been affected. Among primary releases, the retail sales report is next in line to be taken off of the queue, with more releases impacted and uncertainty mounting the longer the shutdown continues.